I've been busy with making holiday cards and I like to try out non-traditional color combinations. I like taking different shades of red and green and giving them a pop with another color. One of my favorite holiday color combos is Real Red, Certainly Celery and Bashful Blue. I started my card with a base of Real Red cardstock and layered a piece of Certainly Celery on top. I then used a circle cutter to cut a partial circle out of Bashful Blue cardstock. I then ran that through my Big Shot die cutting machine with the Northern Flurry embossing folder (found in the Holiday Mini Catalog) and mounted that on top of my card front. I know that snowflakes aren't red in real life, but one of the great things about making my own cards is that I can make my snowflakes any color I want them to be! I put a strip of Real Red cardstock through the Big Shot with the Northern Frost Decorative Strip (also found in the Holiday Mini Catalog). Here's a hand tip: For those little pieces that you need to pop out of the snowflakes to get the detail, I like to use my Hobby Blade to remove them. I put my cutting mat underneath and simply pierce each little piece that needs to come out with the tip of my Hobby Blade. Easy peasy! I applied some 2-way glue to each of the snowflakes and then covered them with Dazzling Diamonds glitter. I put Stampin' Dimensionals behind them and adhered them to my card. For the greeting, I stamped the "Happy Holidays" image from the Four the Holidays set on Whisper White cardstock with Basic Black ink and then cut it apart so that it would fit properly on the front of my card. I think I might just have decided on my holiday cards this year! This is so easy and fast to make. Can you believe that I forgot about my Dasher stamp? Considering that winter is coming soon and will be here a long time in northern Vermont, I try to hang on to the summer as long as I can, but recently, I was going through my stamp bins to reorganize them and picked out my Dasher image and got excited about it all over again. Just as excited as I was when I first realized it was in the catalog last year! I went fairly simple with this card, but what really dresses it up is that beautiful dry embossing on the Old Olive cardstock. I started off with a Real Red card base. I then ran a piece of Old Olive cardstock through my Big Shot die cutting machine inside the Vintage Wallpaper embossing folder. The embossing folders give such a defined embossed detail. I added a strip of retired patterned paper from last year's catalog on top of the embossed cardstock. I stamped the Dasher image on Very Vanilla cardstock with Really Red ink and applied some 2-way glue and Dazzling Diamonds glitter to the antlers. This was mounted on top of Real Red cardstock and then a layer of Chocolate Chip cardstock. I added a folded scrap of Chocolate Chip grosgrain behind the image and popped it up from the card front with pop-dots. The greeting was done with Basic Brown ink and is from the Four the Holidays set and then cut the first word out and mounted it to Chocolate Chip cardstock and mounted it on top of the card front. Quick and simple and a great card for quick holiday card making, Stamp-a-Stacks, workshops, classes, etc. I have a "thing" for the Eiffel Tower. It's kind of like a "beacon of love" to me. A symbol of the city of love. I was privileged to see the tower and travel all the way to the top back in October of 2005. And of course, if there's a stamp set out there with the tower in it, I have to have it. The stamps used on this card come from the Artistic Etchings set. I created this card for one of the projects that I included in my "Sew" Papercrafty Online Course. Even though the course has already started, you can still get in on it and catch up or you can also purchase a Tutorial CD with all of the PDFs on it. Make sure to click HERE to get the details. One of the things that I love to do with ornate images like the ones found in the Artistic Etchings set is to swipe my Creamy Caramel or Basic Brown ink pad around the edges. It gives such a nice vintage feeling to everything and softens up the edges a bit. For my colors, I used More Mustard, Mellow Moss, Kraft and Rich Razzleberry cardstocks. This card only uses one color of ink: Basic Brown. I'm definitely going to be using this stamp in upcoming scrapbook pages from our trip back in 2005. It's high time I scrapped those pages! If you haven't yet played with the new Two-step Owl Punch, you are totally missing out! I've been having so much fun with this punch. The possibilities are endless and it's a great punch to have around if you have kids or grandkids around. They can dress their owls up however they like and have countless hours of fun. I got the inspiration for this card from the Idea Book & Catalog. I tweaked the design a bit and changed colors and stamps. 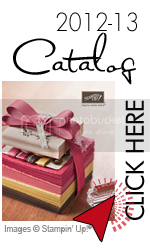 The Idea Book & Catalog is a great resource for ideas and if you don't already have a demonstrator and would like a FREE catalog, make sure you email me at erikaerin2001@yahoo.com and I'll get one sent out to you! I used Rich Razzleberry cardstock for my base and added a strip of Close to Cocoa cardstock along the bottom, which I stamped with one of the greetings from the Three Little Words set with Basic Brown ink. I also stamped the same image on a scrap of cardstock and cut it out to mount underneath the owls at the end. I punched out the owl from Close to Cocoa cardstock and then punched the chest pieces from scraps of the retired Razzleberry Lemonade patterned paper and cut little Pumpkin Pie, Crushed Curry and Rich Razzleberry hearts to add to my card. The stems were cut from retired Kiwi Kiss cardstock. 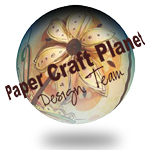 These punches are great ways to use up your scraps and retired papers and cardstock. I used some scraps of Crushed Curry cardstock and punched them with the Scalloped Edge Border Punch and made them peek out from behind my Whisper White cardstock. I popped the owls up with Stampin' Dimensionals. The only thing I would change now is to put some Pumpkin Pie cardstock underneath the eyes to show the beak of the owl a little better. But....I still think it turned out super-duper cute! Oh....the 2-Way Glue Pen is fantastic for helping to glue down small pieces and intricate design pieces cut out of punches and the Big Shot. I've got another fast and easy holiday card for you today. I'm using the same color combination as I did in yesterday's post, as I really love Not Quite Navy for holiday cards. For this card, I used two new items that are coming out September 1st in the Holiday Mini Catalog (go to Stampin' UP's website on Sept. 1st to see it - it's AMAZING!). I used the Northern Flurry Textured Impressions Embossing Folder (on pg. 26) to emboss a piece of Not Quite Navy cardstock and then swiped around the edges with White Craft ink for a frosty look. I mounted this on a piece of Whisper White cardstock as my card base. I embossed one of the greetings from the Four the Holidays set with white embossing powder. To create some extra dimension and some pop of color and contrast by die cutting some snowflakes using the new Northern Frost Decorative Strip in my Big Shot machine with some Whisper White cardstock. This new decorative strip die includes 8 unique snowflakes of different sizes and look fantastic with colored, white, shimmery cardstocks and also from patterned papers! I used an Hobby blade to pop out the small pieces inside the snowflakes but you can also use a stylus, as well. It's hard to see in this picture, but I went over each of the snowflakes with a 2-Way glue pen and then dusted them with Dazzling Diamonds glitter. I mounted two of the snowflakes on top of my card with Stampin' Dimensionals, which gives the card a 3-D feel since two of the snowflakes are popped up, one is adhered flat to the card and then there is the texture of the embossed cardstock. Lovely as a Tree has always been a favorite set of mine and I'm always so glad to see it carried over from catalog to catalog. It's one of those sets that I hope Stampin' Up never retires. It's great for so many seasons and occasions and makes for great masculine cards. The image of the line of trees is what made me fall in love with this set in the first place. It makes for a wonderful holiday card. I went very simple for this card and used a piece of Whisper White cardstock as my card base. I stamped my tree image on White cardstock with Not Quite Navy ink and then sponged some Bashful Blue over the trees. I touched up the trees and the grass with a 2-Way glue pen and then dusted Dazzling Diamonds glitter over it. I mounted all of this on top of Not Quite Navy cardstock and mounted it on my card base with Stampin' Dimensionals (aka: pop-dots). I used the Photo Corners punch to punch some corners out of Brushed Silver cardstock for three of the corners on my card (I just typed "punch" and "corner" more times that I had intended to *wink*). I stamped one of the greetings from the Four the Holidays set with Not Quite Navy ink, along with a small image from the Lovely as a Tree set. This is a great card to get your holidays cards done quickly or if you're a demo and you're looking for a stamp-a-stack card design, as well as for upcoming workshops. Retired Stampin' Up sets for sale! Check out my updated Retired Stamp List! First-come, first-served basis....shipped right to your door for actual shipping! Try phrases like: dramatic savings, clearance, overstocked, reduced rates, buy 1 get 1 free, treat yourself, you deserve it, and don't miss out. Every now and then, I clean out my stamp bins to make room for new supplies. Now that my Open House has come and gone, I've just updated my Retired Stamp list on my blog so that those of you that couldn't make it to the event can still purchase! My sister and I both cleaned out our retired sets and there's a huge pile...almost 40 stamp sets need good homes! There are some brand new sets added to the list that haven't even been mounted or used, but are STILL marked down. Many other prices have been reduced, as well. Pictures included on the List! I've included pictures of all the stamp images on the list. CLICK HERE to view the list and simply click on any picture to bring up a window with a larger view of the stamp images. I'll be updating the list as stamps are sold. Please contact me at erikaerin2001@yahoo.com if you have any questions.